Hey, lookit me posting a Barefoot Bloggers recipe EARLY! I hope my fellow BBs are proud of me, despite the fact that it will probably never happen again. I only managed it this time because I knew this recipe was going to be time-consuming, and since we’re getting into crunch time for our annual Halloween party, I didn’t want to leave it till next weekend. So, here we are. The second recipe for October is Ina’s Vegetable Pot Pie, chosen by Deb of Kahakai Kitchen. Now, I love pot pie, and although I tend to make chicken or turkey versions I have been known to make a mean vegetarian version as well. When you live with vegetarians, as I did for 2 years, you learn to be flexible. However, there were a couple of things about the recipe that I had some difficulty with. First, the sauce/gravy for the filling called for Pernod, which is a licorice/anise-flavored liquor and which I not only would not have in the house, but I wasn’t entirely sold on having that flavor in the pie. In my version, I just used chicken stock and a bit of 2% milk to make the sauce, but added some fennel pollen to up the flavor quotient and complement the fresh fennel that, when caramelized along with thinly sliced onions, makes up the base of the sauce. As an aside, if you’ve never used fennel pollen, I seriously recommend that you seek some out. It tastes like fennel seed but with floral, almost sweet overtones, and is heavily aromatic – sometimes I like to just open the jar and inhale the smell. It imparts a really unique, complex flavor to anything you add it to – we’ve used it in simple spice rubs for pork or chicken, added it to soups and stews, and used it to flavor sauces. In this particular application, I have to say that I think it really made the pie. Its not easy to find, and its not cheap, but it is SO worth the money and effort. I got mine from Zingerman’s about a year ago, and we’ve still got a little less than half a jar left – a little goes a long way with this stuff. Seriously, treat yourself and pick up a jar. If you like the flavor of fennel, you will LOVE this spice. Anyway, back to the pie. I also omitted the butternut squash in Ina’s original recipe, because although J really loved the risotto, he was still “heavily averse” to the idea of squash in the pie. In all honesty, I didn’t really mind, because as much as I love butternut squash I wasn’t totally in love with the idea of using it in this recipe, either. J actually ended up taking care of the sauce and veggies for the most part, and he added a bit of worcestershire sauce and red hot to the filling because he felt it needed a little kick – neither addition was recognizable in the finished pie but they definitely added that certain something that was missing before. Oh, and we totally cheated and added some precooked and shredded chicken breast because we had some leftover from lunches this week that we needed to use up. It was barely enough to be noticeable, honestly. 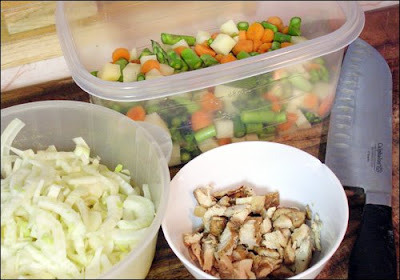 All that aside, making the filling for the pot pie was easy – pot pie fillings are always easy. I mean, all you’re doing is making stew, right? And although the technique here was a little different, it amounted to the same thing. We sauteed the onion and fennel together with some minced garlic, then used that as the base to make the sauce/gravy by adding the fennel pollen, some flour as a thickener, chicken stock and milk. Cooked together for a few minutes, it became velvety and thick and fragrant. The vegetables (a mix of carrots, asparagus, and potatoes) were blanched in boiling water for a couple minutes, then shocked in an ice bath to keep them from getting mushy pre-baking. Then they were added to the pan with the gravy, along with a handful of frozen pearl onions, and everything was all mixed up. Ta da! Pie filling. Easy-peasy. But the crust… now, that’s another story. I have only made pie crust from scratch maybe twice in my life, and I have never felt like I did a really good job with it, but this recipe in particular gave me a LOT of trouble. I mean, to begin with I was at a disadvantage because my food processor only holds about 2 cups, and is nowhere big enough to manage a full batch of pie dough. So, I had to do all the mixing by hand, which is tiring but I feel works a hell of a lot better than using two knifes or even a pastry blender (which I didn’t have anyway) as most recipes would advise. I appreciate the tactile closeness of blending in the cold butter and shortening with the flour and being able to actually feel when the texture is right. I feel like I have more control, and its very easy to see when the mixture starts to resemble small pebbles (as the recipe indicates) and a handful sort of sticks together when you squeeze it. But I also end up with some rather unpleasant cramps in my wrists and fingers. Is it worth it? Who knows. But I can guarantee that when I can afford (both financially and spacially) to have a real grown-up food processor, I’ll probably never do things this way again. But anyway, the point is, I felt like I had a pretty good handle on things up to this point, but when it came to the adding-ice-water step, I frankly didn’t really know what I was doing. I tried to judge by touch when the dough had the right consistency, but I had a really hard time with it. When I felt like the dough had the right moisture content, it was really crumbly and didn’t want to stick together in a cohesive whole. But when I tried to add more water, it started to feel more like slimy play doh than pie dough, and I knew that the more I handled it while trying to work in the water, the less tender it would be after cooking. So, I erred on the side of dryness, and ended up with a dough that cracked and broke left and right, but seemed to stay stiff enough to work with. I suspect I did it totally wrong, but I think I did the best that I could under the circumstances. I divided the dough into two pieces, shaped them into rounds, wrapped them in plastic wrap, and tossed them into the fridge to chill for half an hour. I know this is supposed to give the gluten in the flour time to develop, but I feel like the chilling step just made the dough MORE likely to break when I rolled it out. This may just have been due to my failure to achieve the proper proportion of water to flour in the dough though. I have no idea. After some rather frustrating rolling, I managed to get an evenly flat piece of pie dough that I could trim into two circles that would fit over the mugs I intended to bake the pies in. Having made a full batch of the dough, rather than halving it as per usual, I used half to make some miniature apple pies (another post, forthcoming) and used the scrap of the second half to cut out some decorative pieces for the top of the pies. Completely unnecessary, but it sure looked nice. I spooned half the filling into each large mug, then topped each with a round of pie dough, brushed it with an egg-and-milk wash, then stuck on the pie crust decorations (cut in the shape of pumpkins and leaves) and coated the decorations with more egg wash. The crust got sprinkled with coarse sea salt and some fresh-cracked black pepper before being placed on a baking tray and shoved into a 450 degree oven. About 20 minutes later, the crust was crisp and golden brown round the edges, and the filling was bubbly and leaking just a bit from underneath. Sure looked like pot pie to me. The finished pies were delicious: savory, comforting, and filling, but not overly rich. With the weather being what its been recently – namely, chilly and windy – it seemed like the perfect Sunday dinner. The crust, for all its difficulties of production, baked up just right: crispy, flaky, and buttery. The filling was aromatic and highly flavorful, and just slightly warm on the tongue from the heavy black pepper and touch of hot sauce in the gravy. I couldn’t quite finish mine, but every bite was delightful and satisfying. All that being said… I doubt I’d ever make this particular pot pie again. It was tasty, but not really what I normally want when I crave pot pie. I guess I’m just a little too married to the basic and beloved chicken/potato/carrot/pea combo to want to mess around much. And, although the pie crust was awesome in favor and texture after it was baked, I just found the dough to be way too difficult to work with and the recipe a bit too vague to ensure that I wouldn’t have worse mishaps with it in the future. I think I’ll be searching around for a good, reliable pie crust recipe for awhile. This entry was posted in Food, Drinks and Cooking, Table for Two? Archives and tagged baking, barefoot bloggers, dinners, vegetables. Bookmark the permalink. Your crust looks great – I really struggled with mine as well, especially the shortening. Thanks for the tip on fennel pollen. I will look out for it. I have never tried fennel pollen but now I want to. Sorry the crust was such a hassle for you but your pies turned out looking great–love the mugs and the cut outs–so cute. Great job! Suzie – Thanks for the comment! I’m glad I’m not the only one who had crust-trouble. And yes, absolutely look around for some fennel pollen – its an unusual spice but I’d want to keep it around just for the smell!Deb – Hi! The pies did taste awfuly good, and really, when the crust baked it came out exactly the way I always want pie crust to be, nice and flaky and buttery and crisp. Its entirely possible that I only had such trouble with it because I’m basically a n00b with such things. More likely than not, I just need more practice.I’ll be interested to see what you think of it if you get a chance to work with fennel pollen. Great photos! Your pies look beautiful! I cheated too.It’s ok, I won’t tell. I think your crust looks great! I cheated and used puff pastry on mine. I just didn’t have time. The Pastry God was looking out for you. Good job, and almost everyone added chicken. Fennel pollen…wow! I had a little trouble with the crust as well. I think I added too much water, but I was afraid to go back and add more flour, for fear of overworking it. Is there anything in cooking that causes more angst than pie crust? It ended up tasting good, though. I think that Dorie Greenspan’s “Good for Everything Pie Crust” (I think that the name!) is a simpler recipe. I think your pot pies look gorgeous! And thanks for the heads up on the fennel pollen! They looks perfect, gorgeous in the ramekins with the little fall shapes. YOur crust doesn’t look a bit dry. It looks flaky and buttery and perfect! Veronica – Hi! Glad you like the photos, and thanks for the compliment!chocolatechic – Good, I’m glad I’m not the only one :-p Luckily it seems like most people made some pretty heavy alterations this time around, so I don’t feel too bad.Peggy – Puff pastry is definitely a great substitution for regular pie crust, and I have to admit, a lot of times I like it better. And it certainly is a lot easier!Cynthia – You know, I’ve been considering erecting a small shrine to the whole pantheon of baked good deities recently, as they’ve bailed me out far more than I think is really fair. Perhaps I’ll just start burning incense in the kitchen everytime I fire up the oven ;)Cathy – Sounds like you had pretty much the same problem I did. Did you use a food processor for yours? I really just wonder if my difficulties stemmed from having to do everything by hand… because, well, I got tired, and maybe I just didn’t work hard enough at it. I’ll have to check out Dorie’s recipe – what book is it in? I’ve been meaning to look into more of her stuff since I see all the Tuesdays with Dorie posts every week.Prudy – Thanks for the compliment! Truly, the crust was really just right when it was baked, and it didn’t TASTE dry…. it just seemed it when I was working with it. I really think a lot of my problem is just inexperience, but its hard to tell.